A new update has started hitting the Samsung Galaxy Note 4 smartphone. 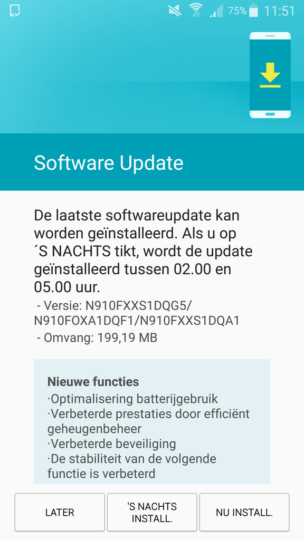 Arriving as version N910FXXS1DQG5 and weighing in at 200MB, it’s a security update that brings along Android fixes for the month of July. Aside from the latest security patch, some other minor changes are also included in the update, which is currently hitting units in Europe. Meanwhile, the Galaxy Note5 has also started getting a new update. Currently rolling out to T-Mobile units in the US, the update arrives as version N920TUVS4EQG1 and weighs in at 24.39 MB. As for changes, while officially, T-Mobile says the update brings along system improvements, reports say July security patch is included.